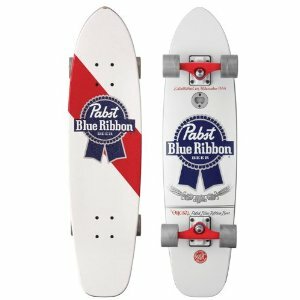 Santa Cruz and the Pabst Brewing Company have teamed up to create the PBR Cold One Cruzer Complete Skateboard. This cruzer board features a great retro shape reminiscent of the early days of skateboarding, when the closest thing to a skate park anyone had was a drained pool that had been left unattended. Thanks to the classic, eye catching design that has come from this marriage of delicious beer and a classic skateboard company, when you say “I’m going to go grab a PBR” you will have to clarify if you are actually going to get a beer or the skateboard. The first thing that really stands out about the Santa Cruz PBR Cold One Cruzer Skateboard is the eye catching iconic graphics. It doesn’t matter if you are looking at the top or the bottom of the skateboard, your eyes will be glued to the iconic Pabst Blue Ribbon logo. Unlike the other PBR deck made by Santa Cruz Skateboards, the Pabst Blue Ribbon Logo is completely visible on both sides instead of being oversized on the bottom. The minimalism of the bottom graphic, a striking blue ribbon on a white background makes it much more timeless and visually appealing. It serves as a great way to highlight what may be the best feature of the Santa Cruz PBR Cold One Cruzer Complete – the bottle opener built in to the bottom of the deck. Santa Cruz Skateboards have used this on a wide number of their Cruzer skateboards, but it has never looked or felt more appropriate than it does on the Santa Cruz PBR Cold One Cruzer Complete. The top graphic is equally minimalist, with only the PBR logo on white, with the exception of a red stripe behind it, perfectly replicating the look of a can or bottle of Pabst Blue Ribbon beer. Like other Santa Cruz Skateboards with top graphics, Santa Cruz Skateboards have opted to use an invisible grip tape that is completely see through. You get all the benefits of grip tape, but you really can’t tell that it is there. In fact, it is very similar if not the same material that is used on boats. The Santa Cruz PBR Cold One Cruzer also rides like a dream. Despite the longer wheelbase, the B121 Bullet trucks allow it to turn quite quickly, like a regular skateboard. That makes the Santa Cruz PBR Cold One Cruzer Skateboard ideal for getting great carves. The wheels on these are 60mm OJ Hot Juice Wheels, which while still somewhat softer and will wear out quicker, are still good wheels. The Santa Cruz PBR Cold One Cruzer Skateboard is a terrific option for people who are interested in getting a longboard but are nervous about making the transition from a regular skateboard. Currently priced at $120.99 on Amazon (With 20% off) this board is currently one of the cheaper Santa Cruz skateboards available today. This entry was posted in Reviews, Santa Cruz, Skateboarding, Skateboards and tagged Pabst Blue Ribbon, Santa Cruz, Skateboard. Bookmark the permalink.